Thanks to Rudy of La Antigua Guatemala Daily Photo for pointing out “Zacatenango” by Francis Dávila, part of a compilation of electronic music from Guatemala. The compilation can be downloaded here. The image was taken in Antigua in December 2001. 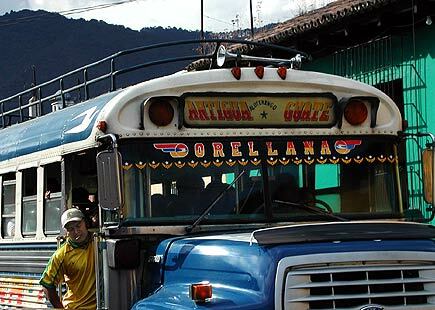 I dig the Zacatenango tune—especially the intro with the bus noises and the driver speaking—brings the essence of a Guatemalan bus riding experience to the music. Of course some squawking chickens and a couple of snorting pigs would be appropriate too. I am glad you like it. The entire anthology is worth it and to me a very good balance among the international electronic scene and its Guatemalan roots.